Defense Secretary Jim Mattis said the international situation today “is the most complex and demanding” he has seen in his four decades of service, and he needs the Army to be “at the top of your game, in body, spirit. We must be so ready … that everybody in the world will want to deal with [Secretary of State Rex] Tillerson’s Department of State, not the Department of Defense, your warfighting skills” and for every day they are in uniform “to be dedicated to getting better,” he said. 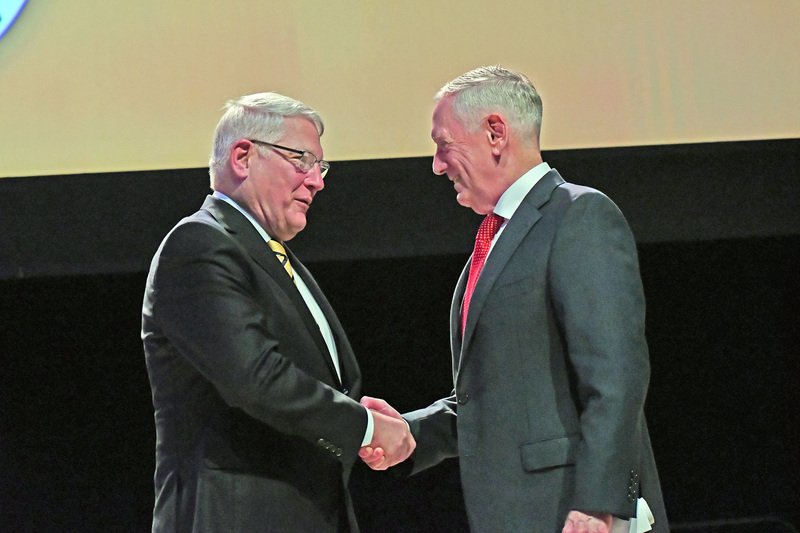 In the keynote address at the 2017 Association of the U.S. Army Annual Meeting and Exposition at the Walter E. Washington Convention Center, Washington, D.C., Mattis cited the persistent threat of terrorists in the Middle East, Russian aggression in Europe and North Korea’s provocations in the Pacific. At a question and answer period following his address to an audience of more than 3,000 AUSA members and guests, he was asked what the Army could do about threats from North Korea. The secretary repeatedly stressed the need for readiness, which is this year’s theme for the AUSA professional development forum. He said he has great confidence in the Congress,” but no confidence in automatic budget restraints, a reference to the 2011 Budget Control Act that sets arbitrary limits on spending.